San Francisco: It's nearly a quarter century since VW unleashed its first pocket rocket on an unsuspecting but soon to be thrilled world. Back in 1983, the GTI combined driving excitement, reasonable price, and everyday practicality, and today, it still does. That reasonable price is significantly more today, but performance is higher too, and the safety and performance feature list runs much longer. 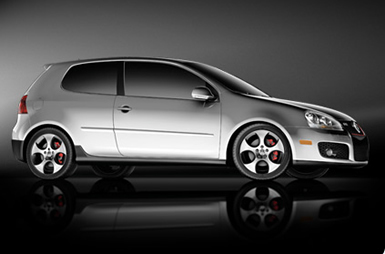 Today's fifth generation GTI is still based on the worldwide best selling Golf. New for 2006, it gets a full 200 horsepower from its turbocharged 2.0-liter four-cylinder engine. A manual six-speed is standard equipment, but if you can't deal with clutching, you can order up the optional Direct-Shift Gearbox automatic with Tiptronic. That way, you can decide whether to shift or to let the car's computer do it. Fuel mileage is rated at 23 City, 32 Highway; the car itself recorded 21.3 mpg over 2,426 miles (nobody reset the mileage odometer). You know that the journalists never drove it gently. My United Gray test unit, an early 2007 model, came with the manual six, and I was grateful, even when I was stuck in commute traffic. Combined with the potent engine, it makes even a trip to 7-Eleven for ice cream a blast. Modern Racer magazine recorded a 6.9-second 0-60 time with the manual and an even faster 6.7 seconds with the DSG. That's plenty quick, but you'll still keep your eyeballs in your head. Certainly there are cars with higher horsepower and faster times, but few if any can match the sheer pleasure of precise control that the GTI delivers, and most of them are more expensive, too. The GTI's new body is familiar territory, a two-box hatchback shape, but every line is changed. The new VW corporate face extends the grille over the front bumper, in this case with black paint, to create a big mouth. I parked next to an early 2000's model during my test week, and you can tell that the window line is much higher now, and that the face is much more bright-eyed and expressive. The Gray body color seems almost too conservative for the shape, but it gives the GTI a sinister edge, so it works perfectly for me. You can get bright red, silver, black, and white as well. No cutesy light blues or beiges for this baby. Inside, the cockpit is all business, but the flat black forms with metallic accents seen particularly well rendered this time, evocative of the past but thoroughly in the 21st century mode. The steering wheel is shaped like the palm of your hand at 3 and 9 and is flat along the bottom edge. Of course, when you turn, that flat section may end up on top or to one side, which feels a little weird at first. The sport cloth seats grip you tightly for spirited motoring, and can be covered in leather if you're willing to pay for it. The GTI, for all its ferociousness, is very quiet inside. This is, in part, because it is built better than the old model. With significant improvements in body rigidity and lots of high tech robotic assembly, the car can be tuned more precisely for maximum performance. Quiet is nice, because my car came with the Package #2 with Sirius satellite radio. It's unbelievable how much you can hear by exploring the dial from one end to the other. I predict that satellite radio will take over from FM within the next five years. Volkswagen has signed an agreement with Sirius that will make it the company's sole satellite radio provider starting with the 2007s. GTI pricing starts at $21,990 and goes up from there. Package 1 provides a power sunroof and satellite radio ($1,370). The sunroof opens with a dial to whatever setting you want and there is no wind buffeting. Package 2 adds dual-zone automatic climate control, leather seats (with heat) and heated windshield wiper nozzles ($3,160). I'm sure the latter feature is a godsend in icy climes. The DSG automatic costs $1,075 and if you want a navigation system, plan on spending another $1,800. My tester came to $28,990. Is that a reasonable price in 2006? You decide.